Ever wonder how efficient your workout really is? We crunched the numbers to reveal the calorie-torching potential of 20 types of exercise, from walking and jogging to surfing and Spinning. Calorie burn is calculated with a formula designed by exercise physiologists, using an activity’s Metabolic Equivalent of Task (also known as its MET), or the amount of energy needed to complete the activity. Cross-country hiking, for example, has an MET of 6.0 and burns about 387 calories in one hour. Backpacking has a slightly higher MET of 7.0, and so it also burns more calories—about 451 an hour—because “the more weight you put on your back, the more you’ll burn,” Lance Cummings, training director at SEALFit Training Center in Encinitas, California, said. “It’s as easy as riding a bike,” goes the old saying—but really, riding a bike can be as easy, or as difficult, as you want to make it. An hour-long bike ride at a leisurely 10 to 12 miles per hour, for example, burns about 256 calories. But crank up your effort to a race pace 16 to 20 mph and you’ll torch around 773. A vigorous Spinning class on an indoor bike can burn nearly as many, about 741 calories an hour. We tend to think of pull ups, push-ups, crunches and jumping jacks as strength-training moves meant to build muscle or warm us up for our “real workout.” But they also burn fat and calories, as well—about 256 cals in 30 minutes—and because you use your body weight as resistance, you don’t need equipment or big machines. “To get the most bang for your buck, you want to do them one right after the other, so you’re not resting and letting your heart rate drop in between sets,” Procida said. Half an hour of moving to the beat can burn anywhere from 100 to 400 calories or more, with slower styles like waltz, tango, and cha-cha on the low end and faster, more athletic styles (think Zumba and Jazzercise) on the high end. You’ll work muscles you’re not used to using during your regular gym routine, Procida said—plus, it’s fun and distracting. Several studies have found that working out with music can help you go harder, faster and farther than you would without tunes. If you’re looking for a cardio workout that will get your heart rate up but go easy on your joints, consider the elliptical: This gym favorite is powered by the user’s momentum (rather than an electronic motor, like in a treadmill), so you can set your own speed and easily adjust as you go. Spend 30 minutes at a vigorous pace and you’ll burn about 248 calories. But don’t get complacent, warns Procida. Want to really rev up your calorie burn? Book the first tee time of the day (so you don’t have people in front of you) and play speed-golf rules, suggests Cummings. Just 10 minutes of moderate jump roping burns about 107 calories. Speed up to vigorous intensity (you’ll know you’re there because it’s too difficult to carry on a regular conversation) to burn about 129. “It’s a little more high impact and you can’t do it for very long, but it’s a really great way to burn a lot of calories in a short amount of time,” Procida said. If you get bored or feel silly jumping all by yourself, look for gym classes that incorporate jumping rope into a bigger workout, she suggests. Spending your weekend at a beach or a lake? Rent a paddleboat and head out on the water with a friend. You’ll burn around 129 calories in just 30 minutes—all while sitting back and enjoying the scenery. (Just don’t forget your sunscreen!) Looking for a more stand-up way to enjoy the bay? Rent a paddle board—basically an extra-large surfboard&mdashl;and a paddle. You’ll get a great arm and core workout, and you’ll burn about 193 calories in 30 minutes. These classes promise to make you long and lean, by stretching and strengthening the muscles in your arms, legs and core. A one-hour class will also burn about 193 calories, as well—”not as many as you would burn doing straight cardio,” Procida said, “but that’s because you’re doing a lot of fine tuning with really subtle movements.” The key to burning calories efficiently, however, is maintaining proper form—especially keeping your abs engaged and pulled in toward your spine. “Rock climbing probably uses more muscles than any other sport,” Cummings said. It’s a major calorie torcher, too: 30 minutes of climbing burns about 709 cals, while 30 minutes of rappelling (coming down with the help of a harness and pulley system) burns about 511. “It’s not just the act of pulling and pushing yourself up, but it’s also all those isometric contractions that you have to use to hold yourself up there, as well,” he said. Thirty minutes of rowing at moderate intensity (100 watts if you’re on a machine at the gym) will burn 226 calories, while 30 minutes of very vigorous (200-watt) effort will burn 387. Canoeing instead? You’ll burn about 161 on a leisurely paddle around the lake. When it comes to walking or running, people tend to burn between 80 and 100 calories per mile, no matter how fast or how slow they are. Half an hour of walking at a casual, walking-the-dog pace (2.5 mph, or a 24-minute mile) will burn about 97 calories. A brisk 4-mph stroll (15-minute miles), on the other hand, will burn about 161 calories in 30 minutes. “If you’re going to walk for fitness, make sure you’re walking for long enough to really burn off those calories,” Procida said. Use a pedometer to track your distance throughout the day, she suggests, or a heart-rate monitor to measure your actual calorie burn. 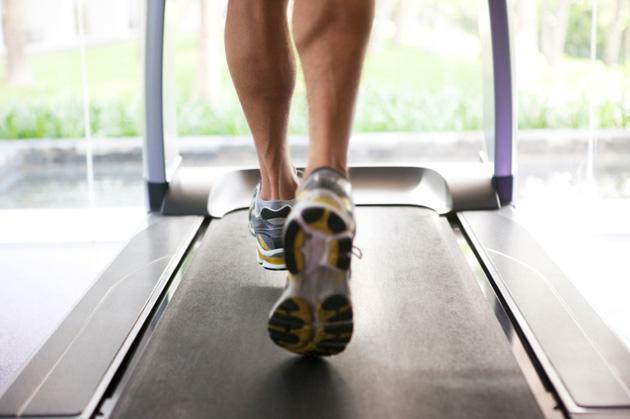 Half an hour of jogging at a 5-mph pace (that’s 12-minute miles) burns about 256 calories. Cranking it up to 7.5 mph (8-minute miles) raises your burn to around 403. Another way to ramp up your burn without adding time? Add hills or stairs. If you’re not a strong swimmer, though, you’ll likely benefit from a few lessons—not just for safety reasons, Cummings said, but to maximize your calorie-burn in the water. Any workout that’s done in the sand is automatically going to burn more calories than it would on grass or concrete because your body has to work harder to stay stable on the uneven surface. Playing 30 minutes of beach volleyball, for example, burns about 256 calories, versus about 97 on solid ground. Even though lifting weights is an anaerobic activity—high-intensity, short-duration exercises meant to build muscle strength rather than cardiovascular fitness—it still burns calories: about 97 in 30 minutes of light lifting, or 193 in 30 minutes of vigorous, heavy lifting. There are so many variations of yoga taught in gyms and studios around the country, and there is also a lot of variation when it comes to calorie burn. Classes like Hatha yoga, for example, are generally gentler and more restorative, and only burn about 161 calories in an hour. A vigorous Vinyasa or Power yoga class, on the other hand, might burn about 432. Don’t automatically count out slower-paced classes, though: “These are usually really great for stress reduction and for focusing on your breath and alignment, and for just checking in with your body,” Procida said. When you’re racing downhill at 20 miles per hour, it may seem like the mountain is doing all the work—but skiing actually uses more muscles than you may realize, Procida said. Plus, a day of skiing entails a whole lot more than just the downhill part, she adds: You’re putting all your gear, on, hustling to and from the lift, stopping, starting, turning—all in all, it’s a pretty good workout, and one that burns about 387 calories an hour. Cross-country skiing takes even more effort, and burns about 511 calories an hour. The actual act of catching a wave (as with skiing down a mountain) may not burn a ton of calories, Procida said, but that doesn’t mean that surfing isn’t a great workout. “You’ve got to paddle with your arms to get out there, and you’ve got to constantly use your arms, legs and core to push yourself up off the board,” she said. During their time out on the water, surfer girls can say goodbye to about 193 calories an hour—and hello to awesome abs. Yes, it’s exercise—especially if you’re on top! Getting busy can set your heart racing and will burn about 48 calories per 30-minute session. For extra athletic action, take advantage of warmer weather: The heat and humidity can make your muscles and joints more flexible, allowing you to try out new positions that may otherwise feel too tricky. Plus, studies show that having regular orgasms can help reduce stress, improve sleep and protect your ticker. Not a bad backup plan on those days you have to skip the gym, huh?